This is one of several plans created for a large church in central Havana. As designed, the church would have had three aisles and deep side chapels. Designed by Juan de la Torre, who came to the Caribbean from Spain in the late 16th century, the church never became a reality. Its plan, which owes much to prototypes in Spain, reveals the energy and imagination invested in large architectural projects for this Caribbean port city. The key across the top explains the different parts of the structure, and was a common feature of architectural plans of this type. The main altar of the proposed church has been clearly labeled, as have many key parts of the structure. The main aisle of the church, if built as planned, would have had a total of three aisles, separated by a colonnade. A tower at each side of the main façade was also planned. 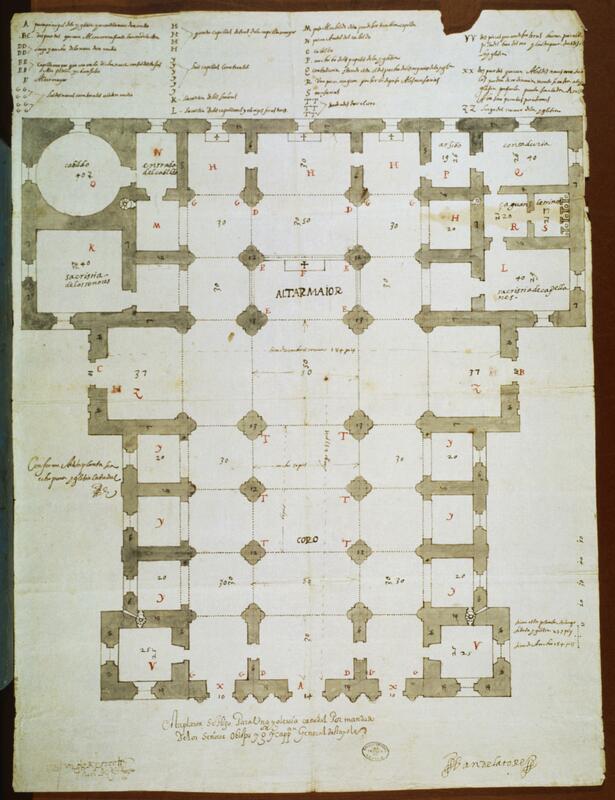 De la Torre envisioned three entries into the main part of the church—one corresponding to each aisle. De la Torre’s design was commissioned by the bishop in Havana. While not known for his church projects, de la Torre had experience in building fortifications and royal works in Havana, and may have been one of the few professional architects at work in the early 17th-century city, one with the experience necessary to build a massive vaulted structure in stone. 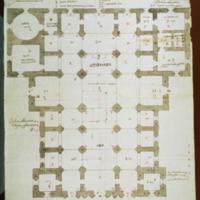 The plan, which measures 57 x 42.4 cm (ca. 22.5 x 16.7 inches), was drawn with ink on European paper and has been signed in the lower right edge. While the rush of early church building in the 16th century was carried out by the mendicant orders who ministered to native congregations, many urban churches like this one were built under the supervision of urban bishops. Yet unlike mendicant buildings, which profited from the labor of local indigenous communities, the construction of urban churches was financed by donations of pious residents, who saw their own civic pride (and aspirations) reflected in the number and grandeur of their churches. In the case of Havana, the city’s available labor and materials were too often siphoned off to enlarge and maintain its impressive fortifications, a top priority for the city ever since its sack by French pirates in 1555. So while Havana’s wealthy residents, enriched by profits from shipbuilding and ranching, may have viewed such an ambitious commission as a fitting marker of Havana’s rise as a Caribbean capital, practical considerations, like the ongoing necessity of protecting their city and livelihood from pirate attacks, intervened. Ramos Sosa, Rafael. 1999. “Planta para la nueva iglesia mayor de La Habana,” In Los siglos de oro en los virreinatos de América: 1550-1700. Pp. 267-269. Madrid: Sociedad Estatal para la Conmemoración de los Centenarios de Felipe II y Carlos V.
Weiss, Joaquín. 1996. La arquitectura colonial cubana: siglos XVI al XIX. Havana and Seville: Instituto Cubano del Libro, Agencia Española de Cooperación Internacional.